Pierre Trudeau was born in Montreal in 1921. His mother, Grace Elliott, was half French-Canadian and half Scottish United Empire Loyalist. His father, Charles-Emile, built a prosperous chain of service stations. He died in 1935. Trudeau was a brilliant student, studying at Jesuit schools, and then taking law at the University of Montreal where he was one of the student leaders against conscription in World War II. He did further study at Harvard, the Sorbonne, the London School of Economics and the School of Political Science in Paris. Trudeau was always an adventurer and could afford to travel. As a young man he hiked with a packsack through Soviet-occupied Germany and Austria using a fake visa to enter Poland, Hungary and Yugoslavia. He went on to Turkey and Palestine where he was seized by Arab bandits. He managed to get away by pretending to be mad, speaking incoherently in classical French and joual: idiomatic, slang or "street" French of Quebec.joual until his captors fled. His travels also took him to Vietnam and China. Trudeau became politically active campaigning against Duplessis and his authoritarian hold over Quebec. Trudeau joined with the striking asbestos miners in 1949 along with Gérard Pelletier and Jean Marchand, two other political activists who joined him in entering federal politics in 1965 as part of Lester Pearson's Liberal government. Trudeau was a strong federalist, wanting a greater voice for Quebec in Ottawa, but opposing separatism. Trudeau was Minister of Justice in Pearson's government and won the party leadership after Pearson decided to step down. He won the next federal election in 1968 in a sweep that has been described as "Trudeaumania," attracting voters with his youth, style and intellect. 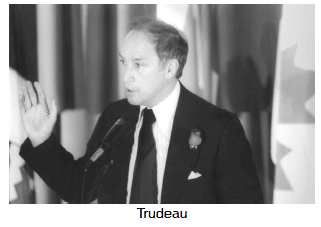 Trudeau held power through most of the seventies and into the eighties. He succeeded in his mission to patriate the constitution and add to it a Charter of Rights and Freedoms which would protect the individual against arbitrary: based on one's own wishes, not based on rule or law.arbitrary action by the state. He also introduced a number of national policies aimed at reducing foreign ownership (mostly American) of Canadian businesses and resources. inflation: a sharp and sudden rise in prices caused by issuing too much paper money or bank credit.inflation which it blamed on Trudeau's financial mismanagement. Trudeau left politics in 1984 to spend time raising his three sons and to work at a law practice in Montreal. He re-entered political debate in 1989 because of his strong objection to the decentralizing elements of the Meech Lake Accord and the Charlottetown Agreement of 1992. He joined the "No" campaign during the debate which preceded the Charlottetown referendum: when a matter is submitted to a direct vote of the citizens for approval or rejection.referendum warning that these constitutional revisions would give too much power to the provinces and also entrench collective rights at the expense of individual rights.